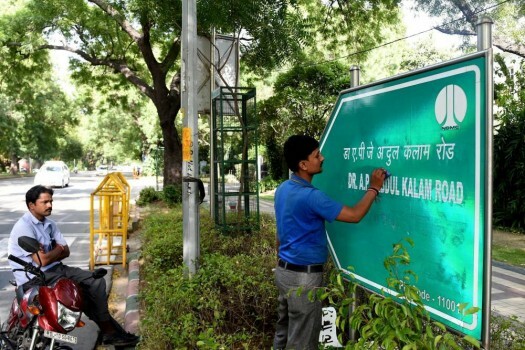 NDMC workers prepare signboard of the newly named A.P.J. Abdul Kalam Road which was earlier known as Aurangzeb Road, in New Delhi. India-Pakistan, locked into a hyphenated relationship of a shared history and a divided present, is not just about rift but also about the many vestiges of unity that have survived seven decades. Raising slogans against former prime minister Rajiv Gandhi, the protesters garlanded the signboard with shoes and slippers and sprayed black paint on it. The central government has also given its 'no objection' to renaming of 22 villages, towns and railway stations across the country since December, 2017. 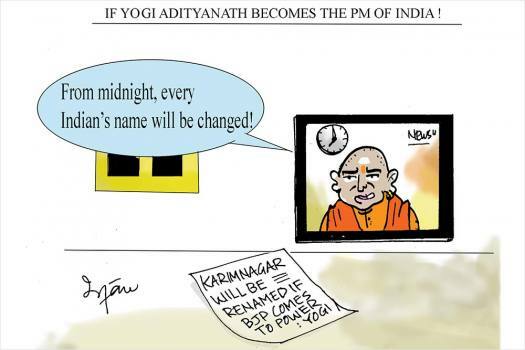 While addressing a rally in Hyderabad on December 2, Yogi Adityanath said that BJP will support in transforming Hyderabad city's into 'Bhagyanagar' if BJP is voted to power. The next hearing of the matter is on Monday. This comment from the chairperson comes a day after the Executive Council approved Dyal Singh evening college to become a full-fledged day college.